The first housing built for miners was the Barracks near Hollins Mine. The Barracks offered accommodation for single men and for married men who would stay there for several days at a time before returning to their families elsewhere. 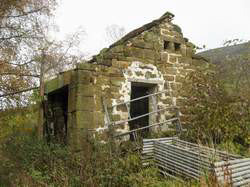 Within a few years housing was constructed for mining and railway staff at several other places in the dale. Most of this housing would have provided homes to families, allowing married men to bring their families to Rosedale and single men to marry and start a family. Housing for railway staff was built at the two termini at Bank Top and near the East Mines, and also at Blakey Junction. The houses at Blakey Junction have disappeared, but four out of the sixteen cottages at Bank Top are still there. One of them was occupied by Willy Wood, a former engine driver, until his death in 1963. 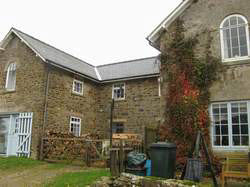 When I went there in October 2009 one of the houses was boarded up, two had become holiday accommodation, and the other was undergoing renovation. 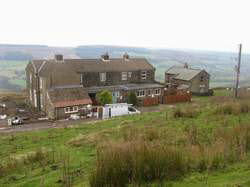 A plumber working on the renovation told me that he had discovered that the water supply to these cottages, which must have dated back to the time when the railway was still in use, involved a 1000 gallon tank that collected water from the surface of the moor and delivered it unfiltered to each cottage. The water may have been reasonably clear during dry weather, but it would have been a lot more discoloured after heavy rain. Some housing for miners was built near the East Mines, but most of it took the form of terraces scattered across the dale. One or two terraces, such as Hill Row, are still in use. In other terraces most of the houses have been demolished, but a few remain. At Florence Row, for example, where 32 cottages once stood, eight have survived. Elsewhere, the housing has been entirely vacated, and either demolished or left to decay. A row of five dwellings called Plane Tree Cottages provided housing for more senior personnel, such as the mine doctor and financial staff. It is still there. Number 3 has become the August Guest House, and can be very highly recommended if you are looking for accommodation. Mine managers lived in superior detached houses. 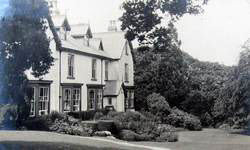 The Lodge in Rosedale Abbey was the home of Mine Manager John Parkin in 1871 and of Mine Engineer John Rosecamp in 1881. It has disappeared. At Sheriff’s Pit only part of a gable end of the manager’s house is still standing. One of the mine staff at Sheriff’s Pit was William Champion, born in 1869. 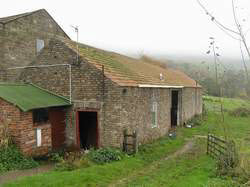 His story is told in B Frank and W Goodall, A Short History of the Iron Working in Rosedale, Ryedale Folk Museum Research Report no. 1, 1967. At the age of 18 Champion took a job as a miner at Sheriff’s Pit, where his father was an undermanager. When necessary he also helped with pumping and bailing out water from the mine, but before long he asked to help the blacksmith. When he made a long-handled fire shovel out of two pieces of iron he had welded together he was appointed as the blacksmith’s assistant. After Sheriff’s Pit closed Champion became head blacksmith at the East Mines. He was especially skilled at making horse shoes, though he preferred it if the horse could be held by someone else as he attached the shoes. His work included making pick axes and hammers, and sharpening drills and other tools. When the East Mines closed too Champion worked at a quarry on Appleton Common, a few miles south of Rosedale, before retiring to Castleton. He died in 1966. 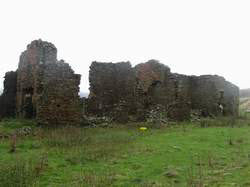 The Barracks, near Hollins Mine. 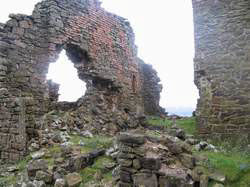 Originally there was a third gable between the two gables that are still there.